For those of us living here in the USA, or for that matter in any country where Christianity is commonly accepted and has become part of the fabric of the culture, it is very difficult to understand life in a region where that is not so. In Africa, paganism and indigenous tribal religions have permeated the culture to such an extent that even when the Gospel is preached and new churches established, it may take many years before there is any notable influence on the local culture. Life is viewed as a difficult and dangerous path to be traveled in fear of superstitions or annoying an evil spirit. With great respect for the elderly (possibly because they have managed to live so long, as the life expectancy in C.A.R and many other African nations is only 52 years!) there is also fear of displeasing ancestral spirits. This brings about great resistance to change or any new ideas. Even when new ideas are presented to maybe help alleviate suffering and improve general conditions, there is often strong opposition. Many believe that ancestral spirits will send curses on a village if change is made. Also even the simple idea of helping someone in need, or giving money to a worthy cause is totally foreign and illogical. Most people focus only on providing for their own family or trying to outwit others whom they see as competition! It’s hard for us to imagine just how uncaring and “unchristian” pagans and lost people can be! But PTL our mission partners continue and the Gospel is being preached – and God is working with us all! We are happy to share some exciting news and answered prayers from some of our partners this month. 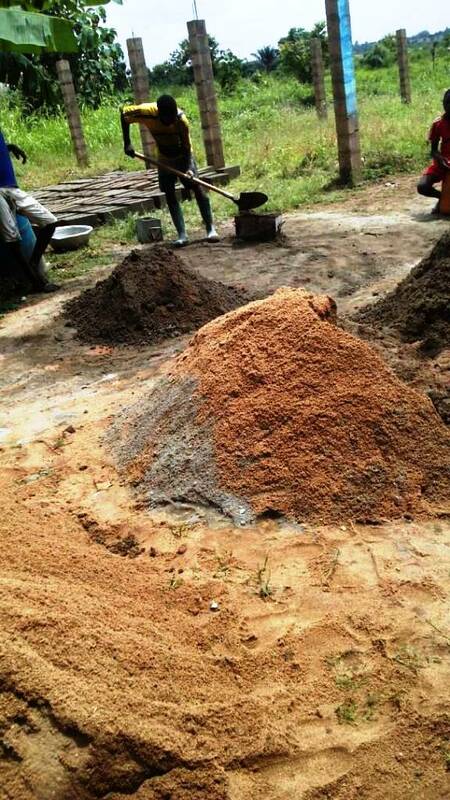 But they do depend greatly on our continued prayers and support, so please keep up the good work! 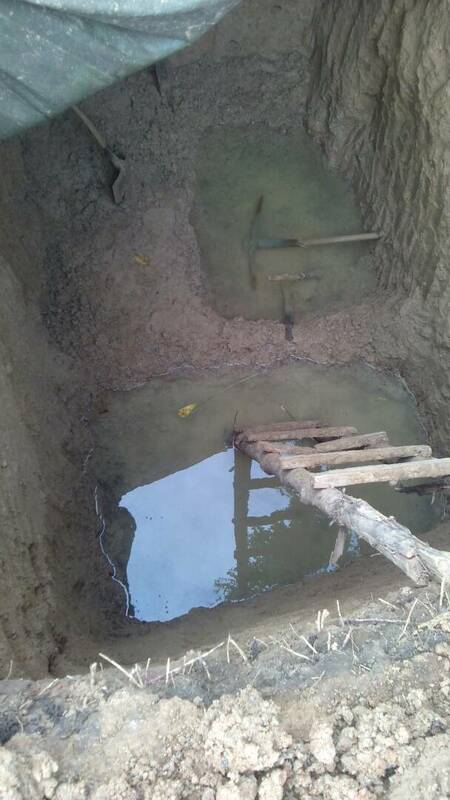 Pastor Sika in Togo tells us that heavy rains continue to cause delay in building the new bathroom block, as there is the need to dig down about 14ft deep for the outhouses and the workers hit water at 6ft! However they have been able to go ahead and prepare all the bricks needed so will soon finish once the weather permits. Pastor Sika was recently visiting with a Christian family in Lomé who were very interested in the JP orphanage, and a very rare thing happened – the family gave the $1,000 needed to build a roof for the new church building there, even arranging for construction workers to carry out the work! You can see the pillars of the new church behind the workers in this photo (making bricks for the bathrooms), and the roof should be finished by the end of August. PTL! The new building has been completely finished at last, and the most urgent need at present is to prepare for the new school year in coming weeks – around $800 for the local school registration, uniforms and books etc. for all 18 orphans. PLEASE pray for funds to come in quickly for this as at present there are none available! Schooling is of prime importance for these orphans, many of whom have only attended sporadically (if ever! ), up until coming to the JP. Pastor Honoré in C.A.R. has been involved with helping teach a big youth camp recently and will be one of four main speakers at a huge national youth camp soon with 2,000 young people from all over the country – sponsored by the government but organized by churches! This is the first event of its kind and could have a huge impact on the youth of this troubled nation, where 80% of the country is under the control of rebels! 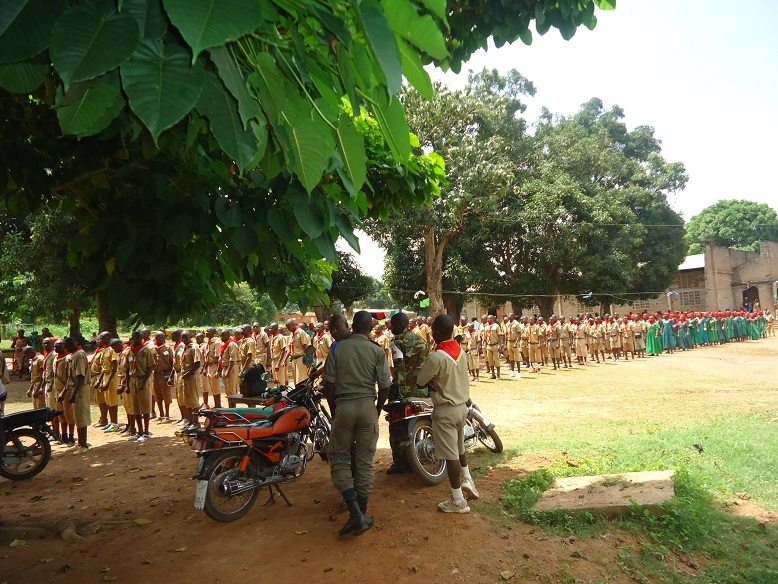 The photo left show teens parading at the recent camp. Pastor Honoré receives many invitations to speak in church events but has felt led to focus on training leaders in his church on the CEERCA site as that congregation is growing very well. 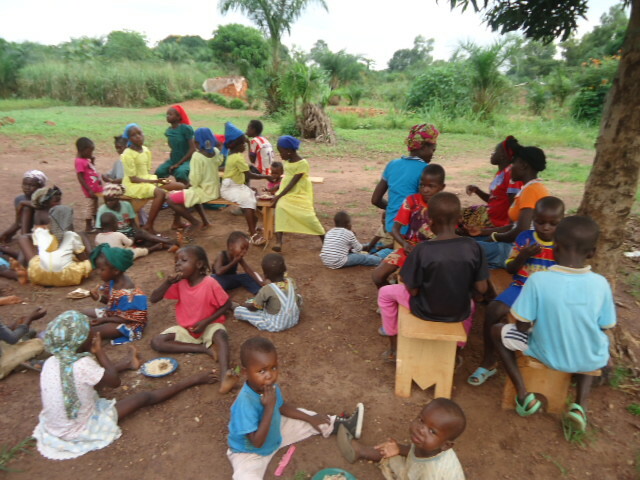 Two baptism services were held there recently and they had a special meal to feed 40 children there a few days ago. They still meet in the temporary tent-like structure but are hoping to soon move ahead with building the walls of the permanent church building which will take about a month. We pray God will soon supply everything needed! Michael in Kenya is busy working hard developing relationships with several different children’s ministries in that area, in addition to doing the school ministry. He had requested help to address the serious problem of sexual immorality among youth there, and so Shirley wrote some new bible study guides on the subject, which are being very well received. Entitled “Discovering the Truth” they take a candid look at the facts today and discuss how the Biblical view applies today. You can learn more and find links to these bible studies on Shirley’s latest blog post.